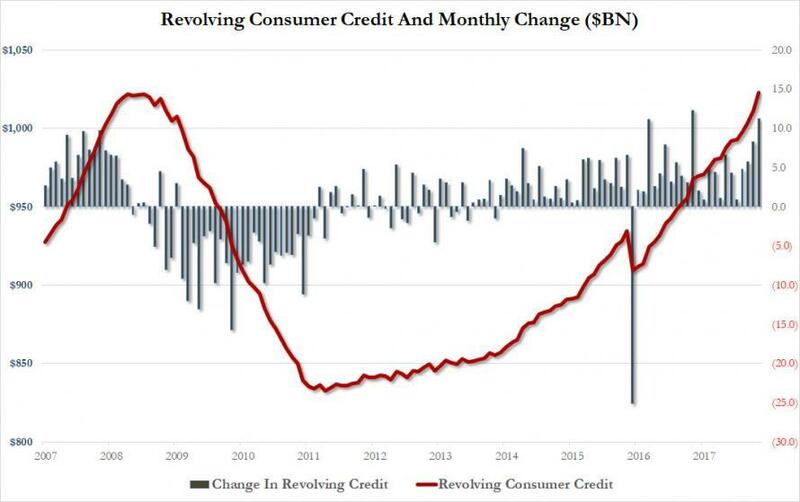 As we've pointed out time and time again, rising consumer-debt levels are one of the most overlooked risks to the US economy, especially as household debt levels (excluding mortgages) climb to record highs and credit-card charge-offs at smaller banks have surged in recent months. Earlier this month, we celebrated the fact that WSJ had finally caught up to the topic, admitting that the combination of stagnant wages, rising interest rates and rising consumer debt could have potentially explosive consequences for the US economy. And now, Bloomberg has also jumped on the band wagon, warning that rising credit card debt could cause problems in the not-too-distant future once baseline interest rates have had time to rise. 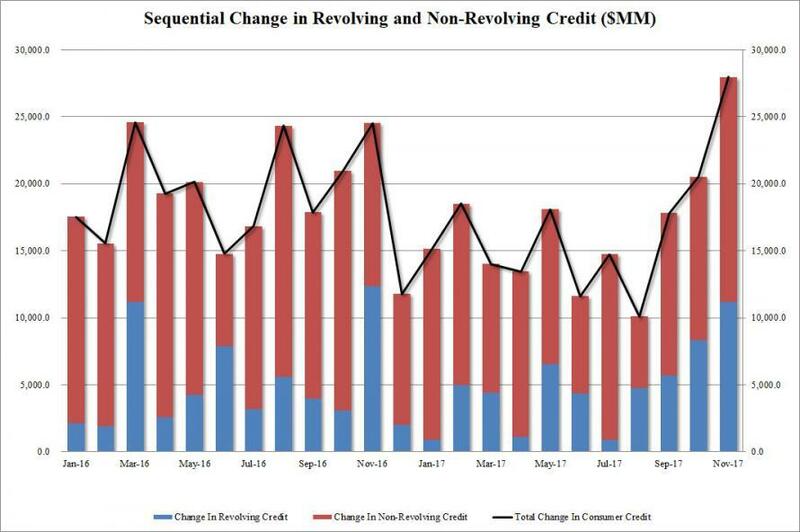 US consumers have accumulated an aggregate $1.04 trillion credit card debt. Or, as Bloomberg put it, "a healthy economy can be a dangerous thing." "When consumers are confident, or over-confident, is when they get into credit-card trouble," said Todd Christensen, education manager at Debt Reduction Services Inc. in Boise, Idaho. The nonprofit credit counseling service has seen a noticeable uptick in people looking for help with their debt, he said. Spending on US credit cards climbed 9.4% last year to $3.5 trillion, according to industry newsletter Nilson Report. And as we've pointed out, student loan and subprime auto debt are also poised to wreak havoc on the economy. "There are warning signs out there," said Kevin Morrison, senior analyst at the Aite Group. Especially concerning is a surge in student and auto loans over the past decade, he said. Meanwhile, the steadily rising Libor (another risk that we were early to spot but that the rest of the financial press has largely written off), could create problems for corporations - particularly those with lower credit ratings. Approximately $350 trillion of contracts are based on Libor, according to ICE. Of that, companies with US debt rated triple-B could present an overlooked risk to US debt markets. Triple-B debt has noticeably underperformed other investment-grade debt classes. The fear, according to WSJ, is that if the economic expansion were to slow, triple-B debt is the most vulnerable - something the IMF pointed out in a recent report about financial stability. To be sure, many Americans might not notice the strain from rising rates - at least not for some time. So far, short-term rates have moved dramatically higher while long-term rates have hardly budged. Many new loans are linked to long terms rates. Also, many loans have fixed rates that were set in stone when the loan was granted. But consumers with risky adjustable-rate mortgages, a class of borrowers who played a crucial role in triggering the housing market collapse, could be in trouble when their Libor-tied loans reset, which they do once a year. Fortunately, these loans are much less common than they were during the crisis. Most credit card interest rates are tied to Fed funds, and while an extra quarter point won't make much of a difference, over time, Bloomberg believes credit card debt poses the greatest risk to the economy. Fewer than 40% of consumers regularly pay their credit card bills. According to the latest Fed data, total consumer debt rose by $28 billion, or the most since November 2001, to $3.827 trillion, during the third quarter of 2018 - an annualized increase of 8.8%, or roughly 4 times faster than the pace of overall GDP growth. 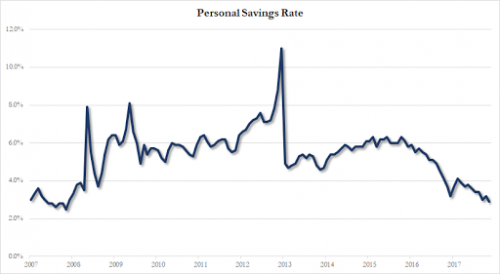 At the same time, the savings rate for US consumers has plummeted to its lowest level since November 2007. Which means the recent economic rebound can likely be explained with two words: "charge it."